If you go online and read about pressure cooking, you will be surprised of how effective a technique this really is. It is safe, and very quick way of cooking food. Besides, unlike microwaves the food is not exposed to any radiations. It is all about the magic of super-hot water. While you read all these great things, it can be really tough for you to start cooking food using a pressure cooker as the recipes are not exactly like traditional cooking. This is where you need good pressure cooker cook books. In fact, this problem is well identified by the cooker makers and invariably, you will find all the latest and new technology based cookers come with a complimentary cookbook. These cookbooks that you get with your cookers, are great to get you started. Their main purpose is to make you comfortable using that particular model. However, you will not find a whole lot of varieties in that cookbook. Of course, if what you get is a proper cookbook, then things are different. However, it is always advisable to purchase one of those pressure cooker cook books for the best recipes. There are many cookbooks in the market and all of them boast of something interesting. This is where you need to be prudent and get something that has value and has benefited others. Online ratings and feedbacks are one of the best ways to determine how good a book really is. 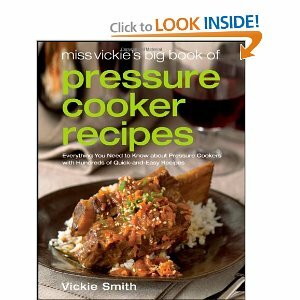 Here are some of the Top Pressure Cooker Cook Books in the market. This book takes a holistic view of pressure cooking. It covers the history of the technique from its inception in the seventeenth century to the modern day revival. It also has sections on the benefits of adopting pressure cooking over traditional cooking techniques. Then you have a comprehensive section on various foods that can be pressure cooked and the time for which they should be cooked to give you the prefect balance of fully cooked and wholesome nourishment. You can use this information to create your own recipes. Among the full-fledged recipes you have a wide range of dishes from full meals to quick fix items like breakfast and even desserts. 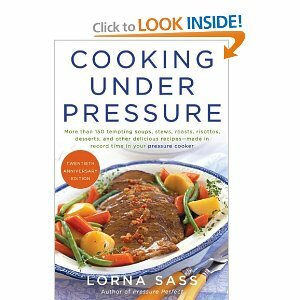 This is book is basically a take on pressure cooking by the food historian Lorna J. Sass. In the modern world where microwaves seem to be the solution to everyone’s time constraints, Sass finds out how pressure cooking could in fact be a quicker and safer technique of cooking. She has recipes ranging from nine minute stews to two minute breakfast items. Then you have chapters on grains, pulses and beans and several recipes that can be created under an hour. There are separate sections for vegetables as well as breads and puddings. This is another book from Lorna J. Sass. The modern pressure cookers are designed to let you cook any kind of dish within predetermined time, so the guesswork is eliminated. 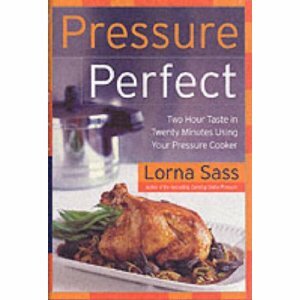 Sass takes this a step further and shows a wide range of dishes that can be created with these pressure cooked foods. The best part about this book is the tips on how to change or modify certain aspects of the recipe to create new ones. It is a very versatile book for one and all.